Each year I make a Halloween compilation CD and I send it out to friends. Each year I try and place at least one song by The Cramps onto the CD. I have been a fan of The Cramps for many years and am sad to see Lux go. I heard the news while I was in Dallas, TX on business. From the MTV website, "Lux Interior, lead singer of influential garage-punk act the Cramps, died Wednesday morning (February 4) due to an existing heart condition, according to a statement from the band's publicist. He was 62. 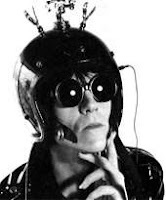 Born Erick Lee Purkhiser, Interior started the Cramps in 1972 with guitarist Poison Ivy (born Kristy Wallace, later his wife) — whom, as legend has it, he picked up as a hitchhiker in California. By 1975, they had moved to New York, where they became an integral part of the burgeoning punk scene surrounding CBGBs." Read the rest of the article here. Halloween just won't be the same without Lux.